Just as your home needs an electrician every now and again, your workplace does too. Commercial buildings in Perth often require even more electrical care than any home since they use more electricity. This need for extra care is why it pays to have a commercial electrician with expertise. Having a contractor on hand is essential to making sure your business is up-to-date. They check outlets, make upgrades to the wiring, and make your workspace more efficient. They can really help when you’re looking to remodel your workplace. It doesn’t matter how big or small your renovation is going to be; it can involve some huge changes. If your plan is to just move around some pieces of furniture, then you still need to move around some outlets so that you don’t have to stretch extension cords. You may just take this remodelling opportunity to address minor electrical problems that you’ve noticed in the past. Your electrician can assist your business with the rewiring of outlets and other fixtures as well as upgrading appliances and ensuring your electrical setup is safe. These electrical services make your company’s building more energy efficient, which will save you money in the long run. Getting electrical upgrades will reduce your business’s risks of electrical fires and short circuits, so you, your employees, and your clients are safer. If you’re not planning on remodelling anytime soon, it’s still smart to contact your commercial electrician regularly. 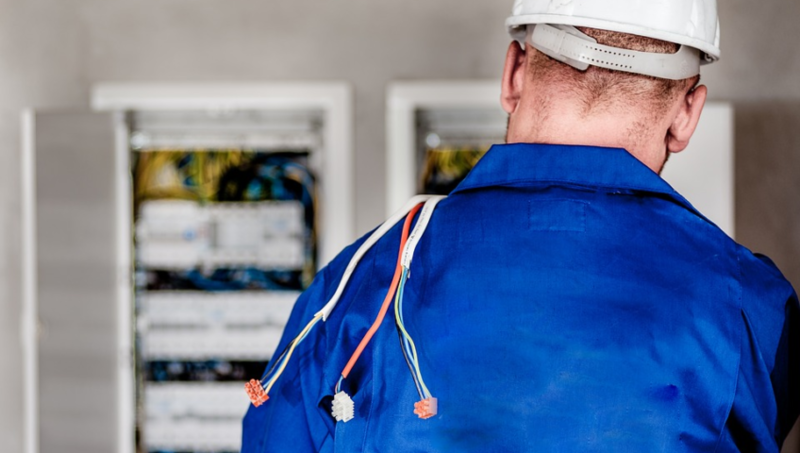 When you call your electrician preemptively, you can avoid the downtime that comes with waiting for an electrician to fix the problem when things go wrong. You can rest easy knowing that your electrician can fix these four issues. You’ve been in your industry for a long time now, or you’re a start-up business that just moved into an older building. Either way, the wiring behind your old walls are out-of-date and should be updated. Another reason your old wiring may need updating is a larger load. As your company grows, the load that your wiring takes on increases. This extra load means that the old wiring in your walls may not be able to handle what you have to offer. Older systems aren’t designed to handle the high-tech appliances of today’s businesses, and they can cause you a number of issues. Calling your electrician guarantees that you won’t have to worry about old wiring. They will come and evaluate your system before providing the necessary upgrades. Power surges happen from time to time even in large commercial buildings, but it shouldn’t happen a lot. You may be tempted to fix your circuit breaker by yourself. You might have done it at home before and feel that your business’s circuit breaker is not much different. However, it’s not like your circuit breaker at home. Don’t try to fix it yourself. If you notice that your circuit breaker is beginning to trip more often you think it should, or more than it usually does, then you need to call a professional electrician to deal with the problem. They’ll be able to identify the problem and fix it in no time. It will never be a good sign when you see sparks flying from an electrical outlet when you plug in a cord. When sparks fly, it’s a major warning sign that there is a bigger issue that needs to be addressed immediately. If you let sparks emit and do nothing, then you risk the chance of sockets and cords melting, and it can result in a fire. An electrician won’t be able to remove the rats for you, but they will let you know if they’ve caused damaged and how much they have caused. Rodents are dangerous to your electric system because they love to chew on wires. This chewing can go beyond just seriously damaging your system and result in a fire. If you want to have your business operate in the safest and most efficient manner possible, you want to take the precautions that are necessary. Contact your electrician before any problems arise. For those looking for a commercial electrician in Perth, check us out at Richtek Electrical and Air Solutions. Our team at Richtek has experience working with a variety of industries throughout Perth and are highly trained. If your business needs electrical upgrades, call us today.